As of July 31 Poland's most notorious stadium reconstruction is complete. Stadion Śląski with impressive new roof and 54,000 seats in shades of blue is indeed structurally ready, as confirmed by the fire department, construction supervisor's office and the public health and epidemiologic supervision. This would be a solid green light and proof of delivery within the announced schedule if not for the fact that in reality works continue on site and not on one or just a few elements. Most importantly, the stadium still doesn't have its signature element, the blue running track that will make it the Polish candidate for largest athletic events. This is how it looks today. 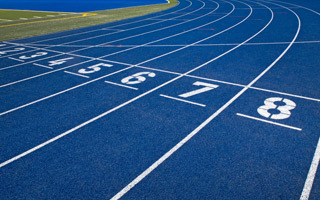 The running track was first expected to be ready in late June, then in late July. Now the deadline is August 31, while this element's price tag has increased from PLN 9.2 to 10.8 million (€2.5m). While it might make some enthusiasts of the stadium anxious, this change won't impede any planned events, which were due to be hosted in September at the latest anyway. What might mke it harder to host events is the contract for eastern parking site. Contrary to regular stadia, this one has it's main stand in the east (with hospitality zones still being furnished as of now) and the associated parking site will only be ready by late September or early October. And even that will be possible only if everything goes smoothly because the contract will only be awarder in mid-August. The price tag for works is expected to reach PLN 4.7 million (€1.1m). Stadion Śląski is the longest ongoing stadium project in Poland, launched in mid-1990s. Divided into several phases, the stadium was due for delivery on various dates between 2011 and July 2017. These latest delays in minor elements may not be significant but continue the long tradition of recent years. Total price tag for the stadium should exceed PLN 650 million (€153m).